Go out of your shell and take the step by step guide on how to draw Nidaime. Nidaime is considered to be the second Hokage and the younger brother of Shodaime. They are known to be the founders of Hidden Leaf Village. He was the successor of his brother when he stepped down. He is known to own the powerful jutsu. Make an oval shape for the head of your figure. Add the facial specifications and define them accordingly. Illustrate the zigzag shape of his short and the strands of his layered hair. Sketch the actual form of his neck. Make the collar and cut of his costume. Take the steps on how to draw Nidaime one step at a time. Highlight your drawing and color it accordingly afterwards. Add some shadows for the final touch of the online tutorial. Woow!! 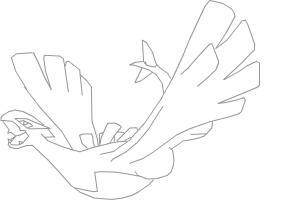 I never saw someone draw Lugia like this!! It's Awesome!